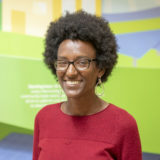 Freweyni Asress (she/her) is an Ethiopian American solar grassroots organizer for Windsor County. Before working at SunCommon Freweyni was an environmental justice and Black Liberation community organizer and facilitator. Her work used a queer Black Feminist, Afrofuturist, abolitionist framework. Freweyni has been living zero waste for over two years. On her free time, she enjoys eating injera, drinking coffee, and reading.